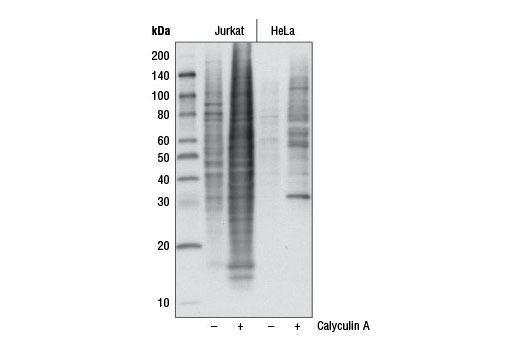 Western blot analysis of extracts from Jurkat and HeLa cells, untreated or treated with Calyculin A #9902 (0.1 µM, 45 min), using Phospho-Akt Substrate (RXXS*/T*) (110B7E) Rabbit mAb (HRP Conjugate). Phospho-Akt Substrate (RXXS*/T*) (110B7E) Rabbit mAb (HRP Conjugate) recognizes peptides and proteins containing phospho-serine/threonine preceded by arginine at the -3 position. There is some preference observed for peptides that contain phospho-serine/threonine preceded by arginine at both positions -5 and -3. This Cell Signaling Technology antibody is conjugated to the carbohydrate groups of horseradish peroxidase (HRP) via its amine groups. The HRP conjugated antibody is expected to exhibit the same species cross-reactivity as the unconjugated Phospho-Akt Substrate (RXXS*/T*) (110B7E) Rabbit mAb #9614.